The MCC program year is winding down, but we still have one more big, fun, MCC family event coming up. That event is of course Santa’s Cottage. Starting Friday, November 30th Santa Claus will take up residence in his homey cottage next to the Village Hall for visits with children starting right after the Village Holiday tree-lighting ceremony. The tree lighting will conclude about 6 pm. Santa will sit down to talk, one-on-one, with the kids until 8 pm. Please note that this year the Village Tree-Lighting ceremony is moving from Kracklauer Park to the Village Hall Plaza. Convenient free parking is available in the Metra lot south of the plaza. The tree lighting festivities will begin at 5 pm with live music, refreshments provided by the Mundelein Park District. After Santa arrives, librarians from the Fremont Township Library will read Clement Moore’s classic poem, “Twas the Night Before Christmas”. The Mundelein Pageant Queens will help Santa pull the big switch to light the Holiday Tree. Santa will return to the cottage on Saturday December 1st, December 8th and December 15th from noon to 3 pm. Goodie-bags, hot cocoa, and cookies will be provided to visitors. Warming shelter is available in the Village Hall. September was a busy month. The 2018 Arts Festival September 8th and 9th was a big success. Great weather and full complement of 45 artists working in a variety of media made for record attendance. Thanks to our loyal sponsors: McDonald’s of Mundelein, Knauz Auto Group, Mundelein Automotive, Big Rentz, K. Hovnanian Homes, Medline Industries, Mundelein Community Bank and Tiemart. The final Park-on-Park car cruise night of 2018 was held on September 12th, over 500 cars participated. The 19th year of Park-on-Park will begin in May 2019. Thanks to our 48 terrific sponsors: www.parkonpark.com/our-sponsors. On September 30th, Karina’s Bakery, family-owned and operated in Mundelein since 2000, has moved to its new location at 401 North Seymour Street. Karina’s owner, Rafael Herrera, comes from a family of bakers. His daughter, Karina Pineda, is the company’s pastry chef. 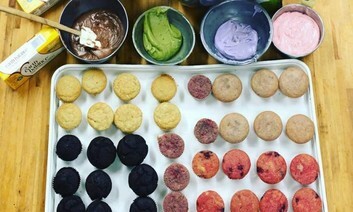 Together, they have created a unique bakery/coffee shop in downtown. At the grand opening on September 30th, one visitor remarked that: “Anyone familiar with the building’s previous use as a bank will marvel at the transformation. Mr. Herrera has created a comfortable, welcoming space—a great addition to downtown Mundelein”. Karina’s Bakery sells wedding cakes, sheet cakes, custom cakes, and an assortment of breads and pastries. It is open Tuesday through Sunday from 6 a.m. to 9 p.m.
Planning for the 2019 Mundelein Craft Beer Festival is underway! The 2019 festival will be held on Saturday, June 8th. Mark your calendar and tell your friends. Beerfest not only kicks off the summer event season, it is also the primary annual fundraiser for Mundelein Community Connection. What better way to have a great time and support a worthy cause? Mundelein Beerfest is widely considered to be one of the best craft beer festivals in the area. It is organized by MCC, but its success is due to a great partnership with the Village of Mundelein, and the active involvement of Tighthead’s owner, Bruce Dir and his fun-loving Brewery staff. For a glimpse of the fun atmosphere and enthusiastic participants at the festival watch the promotional video from the 2018 event. Known as a “brewery friendly/customer-focused” festival, the Mundelein Beerfest attracts the best breweries in the Chicago area. But, it provides more than just a great selection of craft beer. There is great music; a variety of food trucks; plenty of bag sets; convenient parking; easy entry; and souvenir tasting glasses. Going into its 8th year, the MCC Board is looking to make the festival even better in 2019. For sponsorship and volunteer opportunities it is not too early to contact Terry Skirba at mundeleincc@tds.net . Boo Bash: October 27th, 3:30 pm to 6:30 pm. Mundelein Community Center. Contact: www.mundeleinparks.org. Pumpkin Drop: November 4th, 12:30 pm to 1:30 pm. Community Park. Contact: www.mundeleinparks.org. Village Tree Lighting Ceremony and Fireworks Display: November 30th, 5 pm to 6 p.m. Village Plaza. Contact: www.mundelein.org. MCC Business Networking Group: December 5th, Mundelein Village Hall, 8 am – 9 am. Contact: www.mundeleincommunityconnection.org or call Terry at 847-970-9235. Santa’s Cottage: Village Hall Plaza, November 30th, December 1st, 8th and 15th. Contact: www.mundeleincommunityconnection.org or, call Terry at 847-970-9235. Another work of public art--a 66’ by 20’ colorful mural—was recently added to the east wall of the Area General Store at 18 East Park Street. 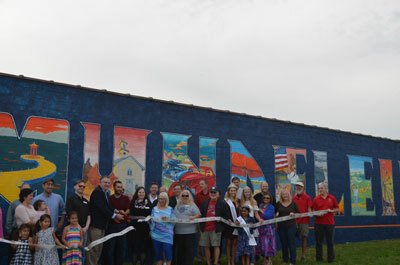 The mural was commissioned by the Village of Mundelein Arts Commission, and painted by visiting Italian artist, Giuseppe Percivati. It was made possible thanks to community-minded support from the building owners Nora and Paul Arroyo (owners of Park Street Restaurant) and Tim Bowes, owner of the adjacent vacant lot. Mr. Percivati who signs his work as “Pepe Gaka”, travels the world painting colorful works of public art. After finishing the Mundelein project he headed ended for Hot Springs, Arkansas to paint his third commissioned piece for that city. Pepe Gaka works can be seen in Lecci, Italy; Karachi, Pakistan; Virginia Beach, VA; Horshan, Australia; Fort Murray, Canada; and Lakewood, Colorado. It may surprise some to learn that this is not Mundelein’s first mural project. That distinction belongs to the “Community of Learners” mural at Washington Elementary School which was added to the school’s entrance in 2010. The new mural joins a growing list of public art displays in the Village, which include a bronze statue titled, “The Protector” installed in front of the Mundelein Police Station on Lake Street in 2015; and, other less prominent pieces like the two whimsical paintings on utility boxes on North Seymour Street, and three colorful “Little Libraries” installed in 2014 by the Mundelein Rotary Club. The Mundelein Arts Commission hopes to facilitate additional public art projects over time. The Arts Commission is very active and sponsors a number of art projects throughout the year. For more information visit www.mundelein.org/MAC. Tighthead Brewing Company received a gold medal at the 2018 Great American Beer Festival (GABF) competition. Presented by the Brewers Association, GABF is the largest commercial beer competition in the world and recognizes the most outstanding beers produced in the United States. 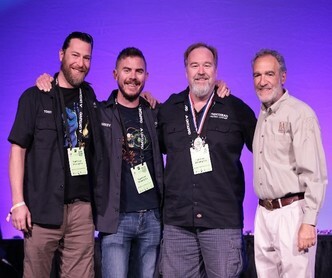 The top three winners in the competition’s 102 beer-style categories were announced September 22 at the Great American Beer Festival awards ceremony held at the Colorado Convention Center in Denver, Colorado. Tighthead Brewing Company was recognized in the Irish-Style Red Ale beer-style category for its Scarlet > Fire Red Ale, an Irish-Style Red Ale with a balance of malt sweetness, toasty roasted barley and East Kent Golding hops. Scarlet > Fire was one of the first beers brewed when the brewery opened in September 2011. Tighthead Brewing Company is a 15-barrel microbrewery located in Mundelein, IL that specializes in crafting quality ales and lagers for all seasons. Mundelein Community Connection (MCC), The Connection for short, is a non-profit, 501 C (3) Community Development Corporation. As such, donations to MCC are tax deductible. MCC is governed by a 9-member Board of Directors whose mission is to organize, promote and host public events that foster pride in our community, and contribute to creating an active, vibrant and welcoming Village. MCC events include: Park-on-Park Car Shows, Farmers Market, Bike Rodeo, Art Festival, Craft Beer Festival, and Santa’s Cottage. Hundreds of loyal volunteers donate their time each year to work at our events. We hope you will consider working at an event in 2019. MCC has five sources of income: 1) an annual endowment from the Village of Mundelein; 2) Corporate Benefactors; 3) Event sponsorships; 4) Event participation fees; and 5) Membership fees. The Annual Endowment in 2018 was $25,000. Corporate Benefactors are large corporations that donate $1,000 or more annually to support MCC. The Connection had three such benefactors in 2018: Sysmex of America, Medline Foundation, and MacLean Fogg Company. Event Sponsors donate to individual events of their choice. In 2018 MCC received support from over 100 local businesses. Participation Fees are charged at some events such as the Art Festival and the Farmers Market for vendors. All events other than the Craft Beer Festival are free to the public. Membership Fees are currently divided into four categories: Individual/Family - $45.00; Business - $200; Not-for-Profit - $35.00.